The application of herbicides (plant killers) can be as damaging as it is beneficial, depending on the method of application. The goal is to apply a properly mixed solution on the proper plant and to avoid damage to other plants. It is all about control of the product. Whether you are applying a synthetic or an all-natural, for us homeowners, the pump-up sprayer is the tool of choice. Products have been developed to replace the pump-up sprayer but none have passed the test of time. The hose-end sprayers are ok for fungicides and fertilizers but they are to susceptible to wind drift and non-targeted plants may be damaged or killed. 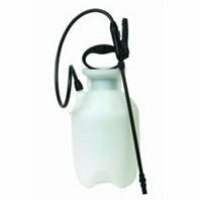 Pick up a sprayer at our store. Looking for a more precise method? After reading the directions, mix up your herbicide. Put on a new (no holes) dish washing glove. Put on a cotton glove over the dish glove. Dip your gloved hand in the mixed solution and wipe the offending plant. You can substitute a paint brush for the glove method. Yes, it will take longer before you’re completed but consider it quality time with the lawn. This entry was posted on Wednesday, June 8th, 2016 at 8:44 am	and is filed under News & Updates. You can follow any responses to this entry through the RSS 2.0 feed. Both comments and pings are currently closed.